In Excel 2010, you can split the worksheet window into separate panes and scroll the worksheet in each pane so that you can easily compare data from two separate worksheet locations. You can make the panes in a workbook window disappear by double-clicking anywhere on the split bar that divides the window. Click the vertical split bar and hold down the mouse button. The mouse pointer changes to a double-headed arrow with a split in its middle (like the one used to display hidden rows). Drag downward until you reach the row at which you want the worksheet window divided. A gray dividing line appears in the worksheet window as you drag down, indicating where the window will be split. Excel divides the window into horizontal panes at the pointer’s location and adds a vertical scroll bar to the new pane. A worksheet in a horizontally split worksheet window after scrolling down in the lower pane. Click the split bar located at the right edge of the horizontal scroll bar. Don’t confuse the tab split bar to the left of the horizontal scroll bar with the horizontal split bar at its right. You drag the tab split bar to increase or decrease the number of sheet tabs displayed at the bottom of the workbook window; you use the horizontal split bar to divide the workbook window into two vertical panes. Drag to the left until you reach the column at which you want the worksheet window divided. Excel splits the window at that column and adds a second horizontal scroll bar to the new pane. Instead of dragging split bars, you can divide a worksheet window by clicking the Split button on the View tab. 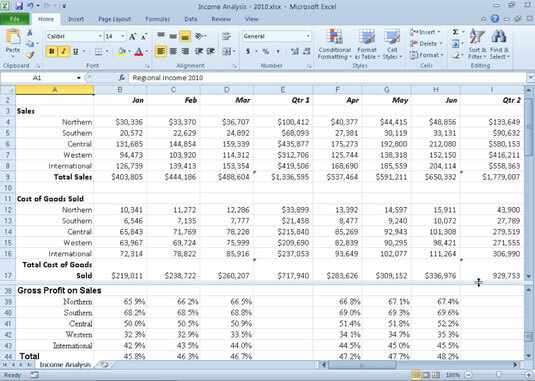 Excel uses the position of the cell cursor to determine where to split the window into panes. The program splits the window vertically at the left edge of the pointer and horizontally along the top edge. After you split the window into panes, you can move the cell cursor into a particular pane by clicking one of its cells. Click the Split button again to quickly remove the panes. A worksheet window split into four panes after placing the cell cursor in cell B10.